Albert Reynolds to the rescue. THIS WEEK, THE world’s attention was grabbed by a bizarre hijacking incident which began in Egypt and ended in Larnaca, Cyprus. However, 35 years ago next month, an even more bizarre hijacking involved an Irish plane, an Irish minister and the Third Secret of Fatima. Aer Lingus flight 164 from Dublin to London was diverted to France after it was hijacked by an Australian former monk named Larry Downey. Flight EI164 was about five minutes from Heathrow airport when passenger Downey, a 55-year-old Australian, is said to have gone into the cabin toilet, doused himself with petrol and the found his way into the cockpit holding a lighter and making threats unless he was taken to Iran. When he was told the plane didn’t have the fuel to get to Tehran, he settled for France. 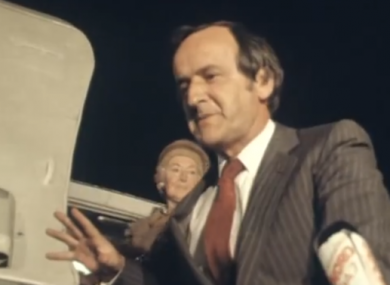 Although the plane was now on foreign soil, Irish Transport Minister – and future Taoiseach – Albert Reynolds flew to France to handle the situation. As journalist Sam Smyth told a 2010 RTÉ documentary, Reynolds was worried about the plane, it being “one of ours”. The Minister, who was obviously concerned for the crew and the passengers on the plane, also had a very real concern for the aircraft because Minister Reynolds would turn to me from time to time and say “That’s our bloody aircraft” he says, “We have to get that aircraft back. That’s Aer Lingus’ plane. Interviewed by media in Dublin, Reynolds told reporters what Downey’s new demand was – the publication of the Third Secret of Fatima by Pope John Paul II. The Sunday Independent also agreed to publish a nine-page religious manifesto during negotiations for the safe release of the passengers. Downey had been a Trappist monk in his native land, but claimed to have been defrocked for hitting a superior. Officials confirmed he had left the order in 1954. Eventually, after a nearly 10-hour stand off, French special forces stormed the plane and apprehended Downey. No shots were fired and no one was injured. That didn’t mean the passengers were released, however. Reynolds boarded the plane and personally greeted them before leading them down the steps to the waiting media. There, he recounted how the siege had ended. They came in from the rear and the side doors. He didn’t notice the lights going on in the cockpit so they came in from behind and surprised him. He didn’t offer any resistance. There was no trouble and that was it and nobody was hurt. Downey was later sentenced to five years in prison and the Third Secret of Fatima was eventually published in 2000. It was described by future Pope Benedict, then Cardinal Joseph Ratzinger, as “probably proving disappointing or surprising after all the speculation”. Email “The bizarre hijacking involving an Irish plane, an Irish minister and the Third Secret of Fatima”. Feedback on “The bizarre hijacking involving an Irish plane, an Irish minister and the Third Secret of Fatima”.